In my last blog, How Much Food Do You Really Need, I discussed how your own brain determines what type of food you should choose and how much you really need to eat of it. I then explained how you can start responding to your own hunger and satiation signals so that you do not over-consume. This week I talk about why people overeat. It is important to understand the nature of your eating habits in order to make a change in them. If you’ve ever seen toddlers eat a meal, you know that they don’t gorge themselves to the point of discomfort. Indeed, many children seem to eat so little that their parents are constantly lecturing them to eat more. So how is that by the time they become adults, many people make it a habit to overeat often? They find that they cannot control themselves, and so they eat so much that they invariably walk away from many meals with a bloated feeling, and an undeniable sense that they should have stopped sooner. I believe that overeating is not a natural human tendency. It is of course facilitated today by the abundance of relatively inexpensive food in Western societies, coupled with the ease of accessing it in grocery stores, supermarkets, and restaurants. In fact, overeating is becoming an issue even in developing countries such as India and China for the same reasons. But these factors still do not explain why people develop the habit of overeating. I submit that, most often, overeating starts as a completely unintended behavior. It can begin at any age starting in, say, the teenage years; for example, purposely overeating to bulk up the body to become eligible for the football team. But, for most people, it is more likely to occur in their 20’s or 30’s. It often starts out as a single instance of overeating, perhaps at a special family or social event such as a party, a celebration, a friendly get-together, visiting a new eatery, or trying a new recipe. We forgive ourselves for this one instance, but if it happens again, the brain starts to rationalize the behavior. We tell ourselves things like, “I can control this next time it happens,” or “I can lose the extra pound easily.” However, each successive occurrence of overeating becomes harder and harder to control, and for many people, it becomes a routine behavior as they feel a desire to eat even when they are not lacking nutrients. Dopamine-based driver: Eating is an enjoyable experience. Smelling food cooking, walking into a colorful supermarket, passing by a restaurant, getting free food samples—all these trigger in you a pleasurable feeling. This is caused by the release of dopamine, a neurohormone that prompts you to want to experience the pleasure of food. 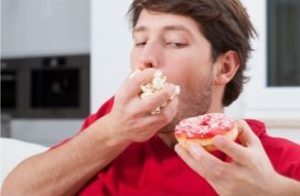 Even if you know it makes you gain weight, the brain has difficulty connecting the act of overeating with its long-term consequences, and you rationalize the indulgence based on enjoyment. Stomach fullness-based driver: The body sends many kinds of signals to the brain that you have eaten enough of the nutrients your body needs immediately. There are signals from the mouth, the stomach, the intestine, and the blood. But many people focus on just the signal from the stomach when it stretches out to a point that they correlate with being full. This comes from past experiences of fullness in the stomach, which are then correlated with no longer being hungry. The problem with this is that the stomach is like a water balloon; its muscles can stretch. If you rely on this sensation of stomach fullness during meals, you can forever gain weight as your stomach grows in capacity. Another problem with this is that, due to the prevalence of grain-based products such as bread, rice, and corn, which absorb water in the stomach, many people become accustomed to needing to feel the sense of fullness that these carbohydrates provide. Stress induced: Stress is any stimulus that you interpret as harmful to your safety, security, or wellbeing. The stimuli that cause stress are essentially the same for most people—perceived threats, illness, injury, overwork, unsolved work issues, family problems, relationship issues, or inconveniences. But one individual may be able to handle many difficult life events that another person would find highly stressful. It seems true that one’s conditioning and training to cope with stress starting in early childhood and continuing to adulthood determines your ability to cope with stressful stimuli. In general, people experience stress as two powerful feelings: fear or hurt. In either case, hormones, specifically adrenaline, are released in the body during the stress response. Adrenaline is also released in between meals, because it facilitates your body’s use of fatty acids as fuel for cells. If you become stressed when you’re hungry, much more adrenaline is released to facilitate movement away from that environment and to obtain fuel for your cells. One reason eating helps you feel better is because food in your digestive system slows the release of adrenaline, so you tend to feel calmer. A second reason people eat when feeling stressed is that they use food to attempt to mitigate the stressor. For dopamine-driven overeating, you need two plans of action. First, learn to concentrate on the joy of eating, as it is an activity that can be enjoyed multiple times daily almost until your death. Since most of the enjoyment during a meal comes from the contact of nutrients with taste and smell receptors, independent of the quantity of food consumed, you will experience the pleasure of eating more if you are hungry compared to eating when not hungry. Second, you need to cultivate various other activities that give you pleasure in place of eating. For control of fullness-driven eating, you can also try two plans of action. First, you need to change the learned patterns of eating until you feel full in the stomach by relearning ending each meal just as you did in your childhood, when the intensity of taste of that food subsides. Second, come to grips with the inevitable consequence of non-hunger eating –i.e. you are going to gain weight. Understand the real purpose of eating as to give your body nutrients and energy. This could help you become more aware of your food intake so you do not overeat at meals. Stress-driven eating can also be addressed in two ways. First, whenever possible, deal with the stressful events in your life after a meal. If this is not practical, when you feel stress-induced desire to eat, put a sugar-containing hard candy in your mouth and let it melt. This will give you about 20-30 minutes of reducing adrenaline release so you will not feel as hungry. The commonality between these drivers is that they all demonstrate that when we overeat, we override the brain’s hunger and satisfaction signals. 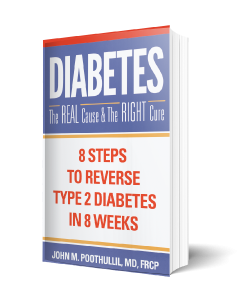 My book Diabetes: The Real Cause & The Right Cure has many recommendations for how you can relearn to eat like you did when you were a child—eating only when you were truly hungry and eating to obtain your nutrition. PreviousPrevious post:How Much Food Do You Really Need?NextNext post:Food for Thought – Literally!